File this under, "Welp, this is worse than we thought." A study published in Nature Geoscience finds that warm seawater is likely getting under an East Antarctica glacier and melting it from below. If the glacier's ice shelf melts, runway melting could cause another 11 feet of sea-level rise—that's on top of previous estimates. Scientists have traditionally worried about the West Antarctica ice sheet, a low-lying region especially prone to runaway melting. Last year, two major studies concluded the West Antarctica ice sheet had started a slow-motion collapse, and there's nothing we can really do about it. 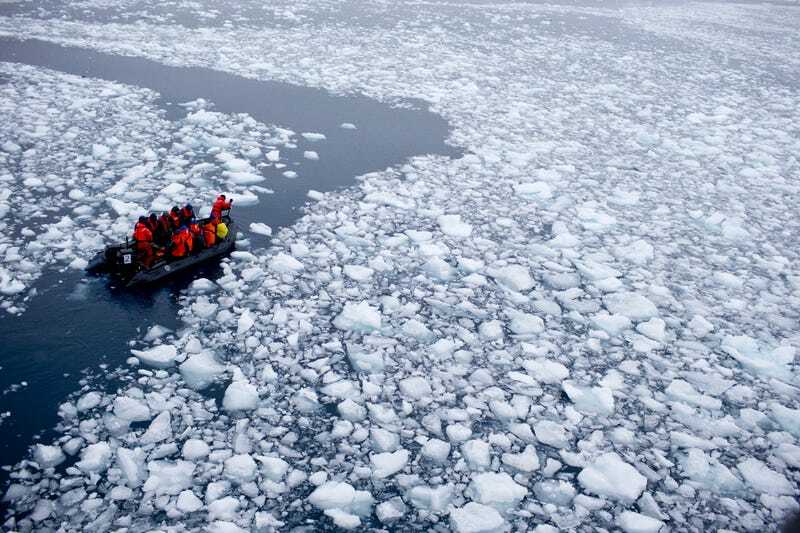 Its melting will cause in estimated 10-foot rise in sea levels over the next few centuries. The result was the discovery of two undersea troughs or valleys beneath the ice shelf — regions where the seafloor slopes downward, allowing a greater depth of water beneath the floating ice. These cavities or subsea valleys, the researchers suggest, may explain the glacier's retreat — they could allow warmer deep waters to get underneath the ice shelf, accelerating its melting. Once warm seawater erodes the ice shelf that separates glacier and ocean, seawater can pour into the low-lying area behind it, accelerating its melting, too. That's where the 11-foot additional sea level rise estimates come in.